Whether your pain is recent or long-standing, it should not be ignored. Ongoing pain can interfere with every aspect of life, ranging from the ability to sleep to the capacity to enjoy daily activities. The Norman Marcus Pain Institute provides consultation, state-of-the-art protocols to diagnose the cause of pain, and treatments that help patients eliminate (or manage) the source of their discomfort. 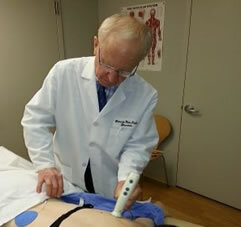 NMPI successfully eliminates pain in patients who were previously diagnosed with sciatica, radiculopathy, failed back surgery syndrome, degenerative disc disease, Complex Regional Pain Syndrome (CRPS, previously called reflex sympathy dystrophy, or RSD), plantar fasciitis, or Fibromyalgia Syndrome. NMPI improves the quality of patient’s lives. A visit begins with an evaluation to determine the source of pain. Determining why you have pain is both simple and complicated. Pain that began in the past 2 months is generally easier to understand than pain that has troubled you for years. In addition to identifying pain that may come from a herniated disc or a squeezed nerve, Dr. Marcus evaluates muscles, the most common cause of back and neck pain, as possible sources of pain. With new (acute) pain, it is important to determine that a serious underlying condition (such as infection, tumor, fracture, nerve compression) is not the cause. When pain has persisted relatively unchanged for months or years (chronic pain), it is unlikely to be the result of a progressive disease that demands immediate attention, but it may require a more in-depth analysis to understand its cause. Dr. Marcus reviews all of your past medical records to understand what your previous doctors evaluated and treated. You will be asked questions to understand how your pain has affected your mood and ability to function. All of this information is important in assessing your pain and creating a treatment plan. NMPI is unique. Dr. Marcus, using his patented evaluation protocol, can accurately pinpoint the source of a patient’s pain that might otherwise be labeled as chronic pain syndrome (i.e. chronic low back pain). In addition to an examination to identify pain that may come from a herniated disc or a squeezed nerve, Dr. Marcus evaluates muscles, the most common cause of back and neck pain, as possible sources of pain. The physical examination at NMPI includes an assessment of all the muscles that may be causing or contributing to your pain complaint. Sometimes the actual source of pain is in a different area than your pain. For example, pain in your leg could be from muscles in your low back or buttock, and pain in your arm may be radiating from your shoulder. Even when other clinicians assess patients for the possibility of muscle or other soft tissue (tendon, fascia and ligaments), they will use palpation (pressure to the suspected muscle), which may not identify the correct muscle as the source of pain and may identify only the area to which pain is referred. Using his patented instrument, Dr. Marcus can electrically identify which muscle is the source of pain and why it may be causing pain. With all your medical history in hand and after a physical examination is completed, Dr. Marcus creates a customized treatment plan tailored to your needs. Dr. Marcus is always available to his patients throughout their treatment. Dr. Marcus uses a holistic approach to the treatment of pain developed by his mentor, Hans Kraus, M.D., which includes exercises that were developed at the Columbia University School of Medicine and given to US President JFK and to 300,000 participants at the YMCA. The therapeutic exercises, Dr. Marcus suggests for patients are designed to correct any deficiencies revealed during the physical examination. Often Dr. Marcus will recommend that his patients perform these exercises daily to relieve pain and maintain a pain free lifestyle. They are simple exercises and can be carried out regardless of whether your muscles in your back, hips, legs, or stomach are weak, tense, or stiff. Tens of thousands of people with low back pain have successfully performed these exercises to eliminate pain. Muscle/Tendon injections focus on the ends of the muscles, where they attach to tendon, bone. When muscles are tender for months, the muscle fibers are frequently shortened, making the muscle stiff (and prompting the feeling that “if I could only get someone to stretch or ‘crack’ this spot I would feel better”). You may experience increased pain on arising in the morning, after sitting or standing for long periods, or with athletic activity. Many patients feel a gradual spread of their pain without any obvious cause. It may seem impossible to find the source of your pain. If Dr. Marcus electrically identifies the muscles that are the source of your long-standing pain, his painless injection technique can restore the muscle to normal, flexible, and comfortable function. Patients who receive muscle or tendon injections are rarely if ever injected more than once into a particular muscle. Injections are always followed by physical therapy to restore the muscles’ strength and flexibility. Many of our patients leave pain-free and only do simple limbering exercises to maintain their relief! Patients who are not candidates for injections may receive a variety of cutting-edge interventions: we have found a powerful (15 Watt) Class IV low level laser to be effective in patients with persistent discomfort related to severe muscle and joint pain, arthritis, and discreet point tenderness, all with low risk and minimal side effects. When you have had long-standing pain, it causes the nerves in your spinal cord and brain to become inflamed. This is called central sensitization, and leads to increased pain not only in your original painful area, but also throughout your body. If that happens, you may feel a spreading, diffuse pain rather than a precise area of pain. Dr. Marcus treats this type of pain with novel medications so that some patients can either reduce or entirely eliminate their use of strong pain medications. In addition, Dr. Marcus will sometimes recommend using topical compounded preparations to help reduce or eliminate long-standing pain. If Dr. Marcus determines, after a complete evaluation and examination, that additional consultations or surgeries are indicated, Dr. Marcus will refer you to specialists with whom he works closely.